Altitude Film Distribution is delighted to announce the DVD and digital release of Steven Riley’s highly regarded feature film about the record-breaking West Indies cricket team of the 1970s and 1980s that would bring the world to its knees, a nation to its feet and prove that and bat and ball could be an effective way to battle against racial injustice. ‘FIRE IN BABYLON ‘(12) is available to own on DVD on 13th October 2014 RRP £12.99 and available On Demand from 3 November 2014. 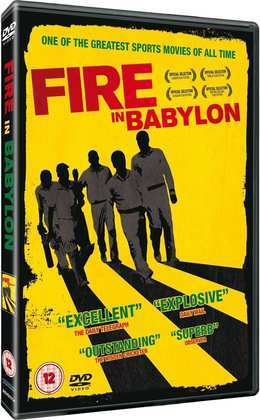 FIRE IN BABYLON chronicles the rise of the West Indies cricket team originally known as the ‘Calypso cricketers’, the highly entertaining losers who would go on to become the dominant cricket powerhouse for fifteen years, and become known for its fast-paced fast bowling that would decimate rivals. Joint winner of the U.N.E.S.C.O. Award at the Jamaica Film Festival 2011 and from the producers of The Last King of Scotland and Marley, this entertaining film includes interviews with cricket legends such as Viv Richards, Ian Botham, Colin Croft, Deryk Murray, Joel Garner, Gordon Greenidge, Joel Garner and Clive Lloyd. Set to reggae classics from Bob Marley and the Wailers, Gregory Isaacs and Burning Spear, FIRE IN BABYLON is a rousing, inspiring film about how a sport not just united the Caribbean Islands; it also shows how cricket earned the West Indians the respect, love and admiration of sports fans worldwide.